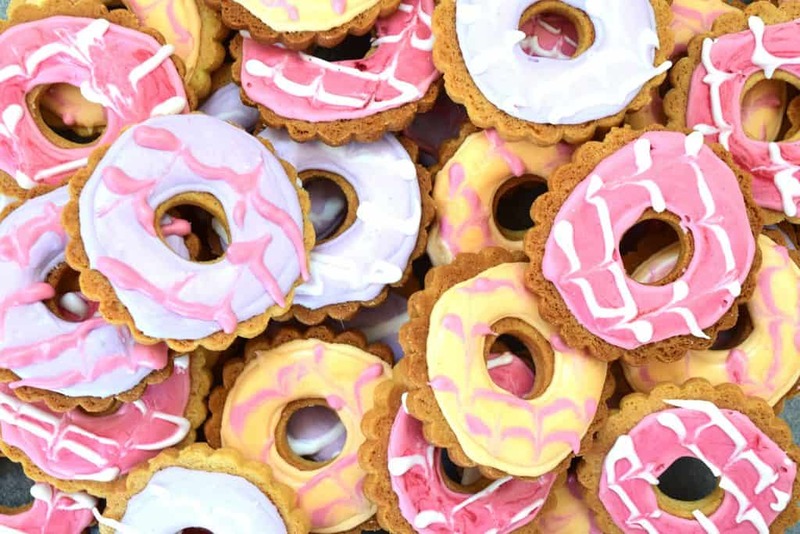 A fun, nostalgic treat for the weekend, try making your own Party Rings. 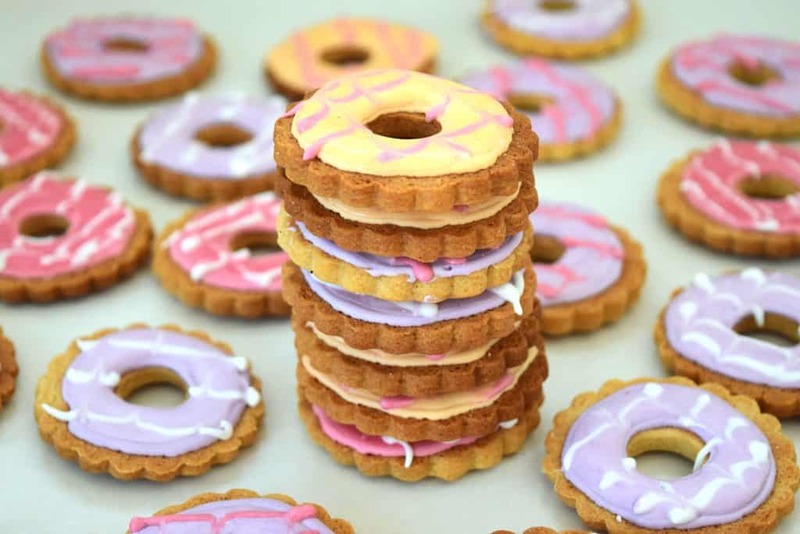 I’m pretty sure that when you speak to any adult born in or around the 80’s and mention Party Rings, it will transport them back in time to some loud, crazy kids party, possibly having a My Little Pony/Thundercats theme, pass the parcel, a buffet of jam sandwiches, crisps and these little iced biscuits plonked somewhere in the middle. Let’s face it! No party was the same without them! I, for one, like to indulge the child within and enjoy a few of these every so often. They are actually really fun to make too! I was actually having so much childish fun in the kitchen as I decorated them, I nearly “forgot” that I was meant to be having a baking day with the boys until I looked up and saw their bored looking faces, watching Mummy have all the icing fun. Oops! 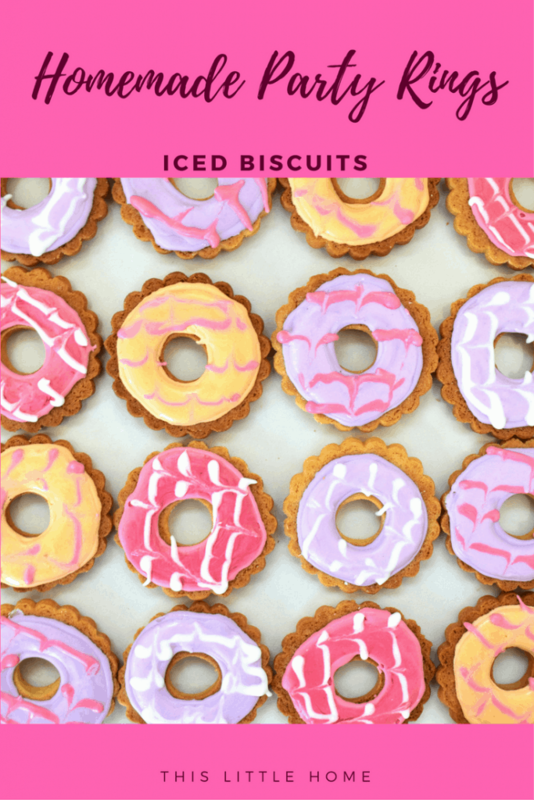 The biscuit mix is really simple and easy to make and if you’re struggling to find something to cut the hole out of the middle, I used an icing nozzle, but a bottle cap may also work. Icing the biscuits can get a little messy, but other than the post bake cleaning, mess is fun too. Just ask my boys and they will certainly confirm this! 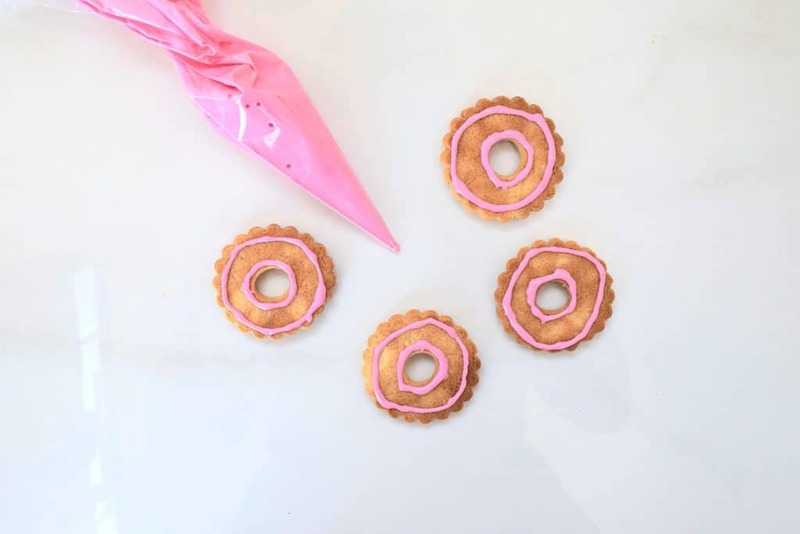 Try to cut only a very small end off of your piping bag so the icing doesn’t spill everywhere. 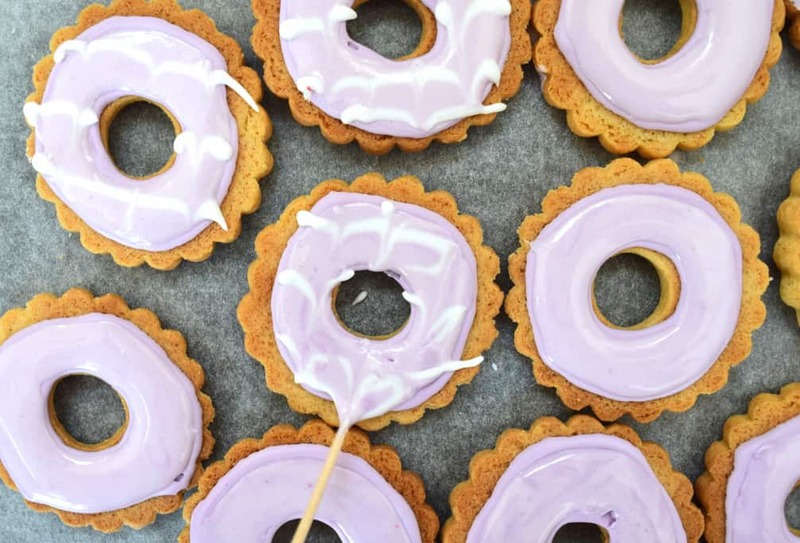 I have used a method called flood and line icing to decorate, this helps to keep the icing on the biscuit without it dripping over the edges but if you don’t have enough time, just ensure your icing is thick enough and spread a thin layer over each biscuit. The taste will be the same of course, they just might look a little messier. But, if you are happy to munch on messy looking biscuits, I am totally behind you! The taste is priority, right!? Looking for more fun baking projects? Try these romantic chocolate brownie cupcakes now! What’s your favourite treat from childhood? Share in the comments below. Mix the flour, baking powder and sugar. Add the butter and mix until you have a crumbly texture. Add the syrup, egg and vanilla and mix together until combined. As soon as it all comes together in a ball, stop mixing. Cover the pastry in clingfilm and place in the fridge. Leave to rest for 30 minutes. 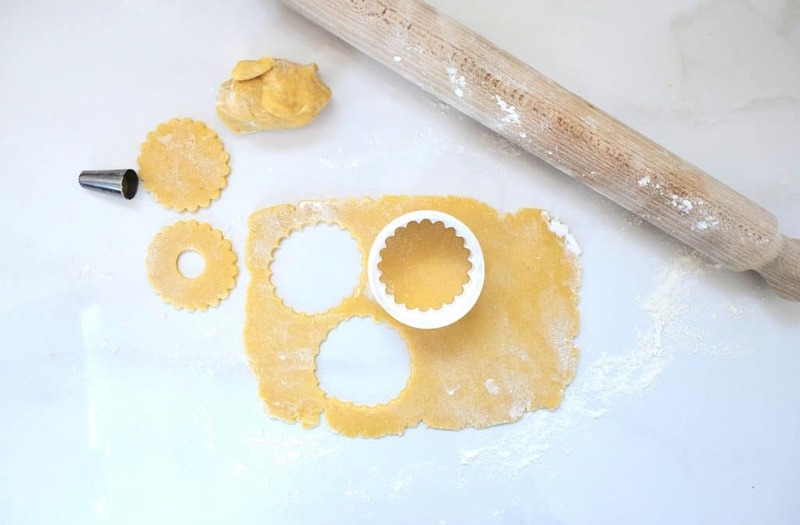 On a floured surface, roll your dough out to roughly a 5mm thickness (this is easier to do in batches, place the extra pastry back in the fridge). 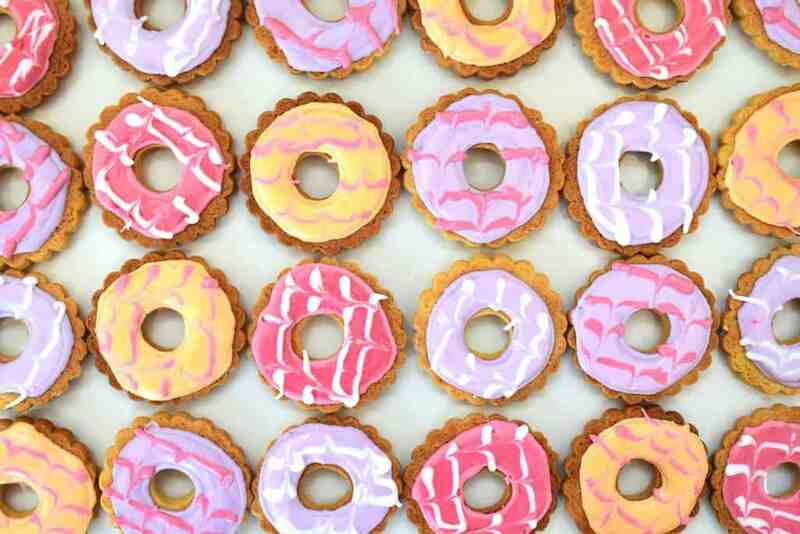 Cut your biscuits out using a cookie cutter, cut a small hole out of the middle of each biscuit. Place your biscuits on a lined baking tray with a little space in between each one. Bake your biscuits in a preheated oven at 170oc (150oc fan assisted) for 10 minutes. Remove from the oven and allow to harden a little before placing the biscuits on a cooling rack. Mix the icing and water and whisk for 5 minutes using an electric whisker or longer if doing it manually. Mix until the icing forms peaks and turns a brilliant white. Spoon some icing into a separate bowl add your food colour and mix until the desired colour is achieved. Place the icing into a piping bag and snip the very end off. When all of your biscuits have been lined mix a little extra water into the leftover icing to make it runnier. 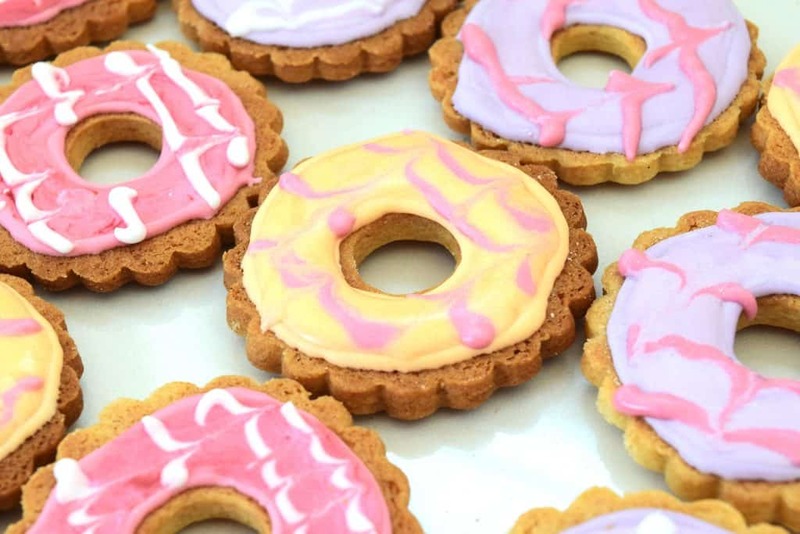 Mix your runnier icing again with your desired colours, place in a piping bag and fill the biscuits in, inside the lines. Be careful as it has a tendency to pour out of the end so this must be done quickly. To decorate, use a complimentary colour of your choice with your leftover line icing. Pipe lines across the biscuits and then using a toothpick pull it through in the opposite direction to create points. Turn your oven on to the very lowest setting and place your biscuits back in to set for 30 minutes.